Parts of Oxfordshire have been put on flood alert with heavy rain forecast. Alerts have been issued by the Environment Agency for stretches of the River Evenlode, Windrush, Rae, Glyne and for Ginge Brook. The Met Office has issued a yellow warning for rain - meaning be aware. 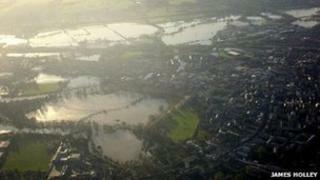 Andrew McKenzie of the The British Geological Survey (BGS) said: "Levels are already high. It's the legacy of nine months of really wet weather." He added: "The snow melt is going to make a small contribution, but the heavy rain is the real issue."